RUSH: This Manafort trial, people are looking at this as a way to discredit Mueller, and the other side of it is hoping for a conviction of Manafort to justify Mueller and what he's doing. And so this case is really not even about poor ol' Paul Manafort. It's about Mueller and his foolhardy, stupid, waste-of-time investigation. Well, anyway, the jurors in the Manafort trial yesterday sent the judge four questions. And one of the questions, the question that caught the attention of the Drive-By Media, which is the representatives of the American left or the Democrat Party. The jurors or a juror, we don't know how many, wanted to have a redefinition of "reasonable doubt." And so this brought out all of the experts. So the judge defined it as "doubt that you would arrive at via reason rather than emotion." Whatever the judge said, that's what he meant. The judge was trying to say you must assess this without any emotion. These are not his words, by the way, but this is what he meant. He said this is the doubt that reason would lead you to believe exists, as opposed to emotion and so forth. So here come the experts all telling us what this means. And the consensus opinion is that this question from the jury is bad for the prosecutors. It means, according to the experts, that the jurors are looking for a way, any way, to exonerate Manafort. And then others come along and say "you can't say that." The bottom line, nobody knows. This is 12 citizens that none of us have ever met. We have no idea what these people -- Professor Dershowitz was on TV this morning -- well, Professor Dershowitz is on TV all the time now. 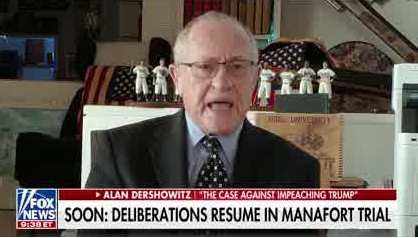 I think Professor Dershowitz has a studio with three or four cameras in it, one camera per network. And he's got an assistant that just tells him which network is next up, and they move that camera in position. Whether that's at his place on Martha's Vineyard's, I don't know. I love Professor Dershowitz, don't misunderstand. But you know what Professor Dershowitz said? He was asked, "Is there gonna be a verdict today, Professor? You're a trial lawyer. You're an expert. You're a legal professor at Harvard. 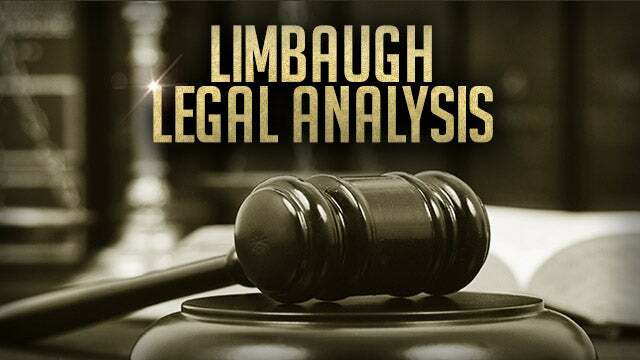 Will there be a verdict today?" Nobody knows if there's gonna be a verdict today. Professor Dershowitz said (paraphrasing), "Well, the way to look at it is this. It's Friday. Do these jurors want to get out of there and go home? Do they want to go home and be done with this or do they want to have to spend another weekend thinking about it and have to come back on Monday?" And I'm watching this and I'm thinking, okay. Here's a guy on trial for whatever, lifetime imprisonment. And his fate is tied to 12 Americans worrying about whether or not they get out of there today in time to wrap this up for a weekend. But it's probably true! There may be an element of that among some of the jury. The bottom line is we don't know. And so CNN, in order to cover their bases -- oh, and folks, remember two weeks ago that I told you that the latest theory -- and I was putting it out there, I said you're gonna see this. The latest theory is that Trump wants to lose the House, he wants to lose the House, wants the Democrats to gain control of the House to guarantee his reelection in 2020. Well, now that theory is now becoming popular. And it was put out there by me, your guiding light, at least 10 days ago. So guess who's back? Nate Silver. Nate Silver, 75% chance the Democrats take the House. Where have we heard this before? Well, we heard this before in 2016. Nate Silver, 92% chance Hillary Clinton is elected president. And then about 9:30 or 10 o'clock on election night, Nate Silver, the New York Times changed 90% Donald Trump will be elected. What good is it today, 75%, he's just analyzing the polling data that he has. Seventy-five percent chance the Democrats win. So CNN is doing the same thing. CNN's covering their bets in case Manafort is found not guilty. CNN is running a story, they're crediting themselves for breaking news. It's like you're watching CNN, and they've got a chyron banner the bottom of the screen that literally says, CNN, colon, and then the story. I mean, it's the most amazing thing. They're crediting themselves as though CNN found a breaking story. Anyway, CNN says that the special counsel's office has told them that Mueller has three times the evidence on Manafort for the next trial. 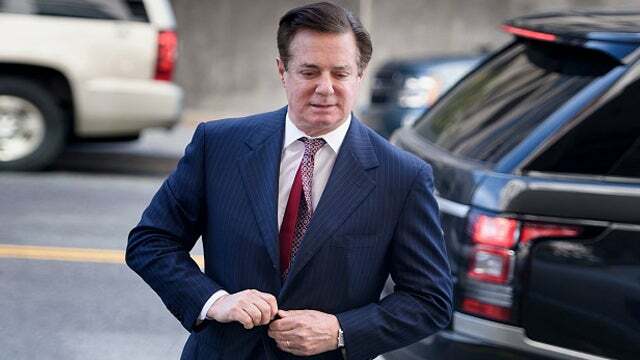 So there is some fear out there, ladies and gentlemen, that Manafort's going to be found not guilty in this trial. And it's all because of those questions that the jurors asked the judge to help them answer yesterday. And the media is totally invested in Manafort being found guilty and maybe shot at dawn tomorrow, shot by somebody wearing a Trump mask, wearing a make America great hat. That's the media fantasy, that Manafort's guilty, goes to jail for the rest of his life, they can blame Trump for it and the Russians. But in case he's exonerated today or whenever, don't worry, CNN is telling their dwindling audience, because we're told that Mueller has three times the evidence on Manafort for the next trial. And there is a next Manafort trial next month that takes place in Washington. So the bottom line is, nobody knows what the questions meant. You can talk to very many different legal experts, and you'll get that many different interpretations. And the smart ones will tell you nobody knows. Look. Who are these people on the jury? We don't know, but it's northern Virginia. It's suburban Washington. I mean, what are the odds that there are some really severe Trump haters on this jury? I mean, pretty good, given that that's the jury pool to select from. Now, it's interesting. The Manafort defense did not put on a defense. And I have many people asking me about that in the email because they know that my dad was a lawyer and they know that my brother is a lawyer, and so they think I know the answers to these questions. I would know the answer to this if my family dug ditches, which would never happen, but I mean if they did, I would still know the answer to this. The reason why you don't put on a defense is to put 100 percent of the pressure on the prosecution to prove their case. If your case, if your defense is reasonable doubt, then you don't want to put anything on that might create reasonable doubt about your own defense. The reasonable doubt must remain squarely, securely, and exclusively on the prosecution. It's a big roll of the dice not to put on a defense, to handle the case in opening arguments and in cross-examination and then in closing arguments, but that was the decision the Manafort lawyers have made. And we'll see. Now, the stats on this, defendants who do not put on a defense, it's not good. But there's another stat too. Do you know that government prosecutors' win rate is like 92%? They just don't lose. And you know why? You know one of the reasons they don't lose? People believe government, but the judge and the prosecutors, I mean, they see each other all the time. Defendants are in and out. The defense lawyers maybe get to know judges pretty well. I mean, they all know each other, but the prosecutors are there every day, different case, different day, relationships are built. There's just a presumption that if the government's trying to put somebody away, they did it. And it extends down to state DAs and state attorneys. It extends down to your local county DA. There's just this presumption that if the prosecution and the police say somebody did it, they did it. And even with jury trials, it's like a 92% conviction rate for prosecution. So Manafort has a big hill to climb here. And his defense knows what they're doing. And I think not putting on a defense and putting total burden to prove beyond a reasonable doubt on the prosecution is good. Plus they saw that the judge here really had a problem with these prosecutors. The defense lawyers know that this judge is fully aware what these prosecutors are doing. They're going after Trump. They don't care about Manafort, really. The judge even called them out on that. So that's the Manafort trial.